Why do people scorn Damien Hirst's polka dots, Murikami's happy faces or Jeff Koons' balloon figures? Why are art critics dismissive of these artists as "cliché" or "over-exposed"? Do they not see the beauty in the trivial, the reassuring in the familiar, the genius in the mainstream? 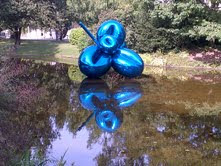 I went on foot, by boat, by train and by tram on a four hour trip to see an exhibit by Jeff Koons and I returned that same blissful summer day, traversing Swiss highlands and lakes immediately after I having seen the impressive show. 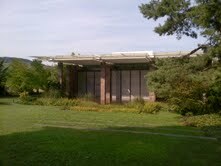 The journey to Foundation Beyeler is the beginning of the annual adventure. Always a few kids or a single one in tow, in delectable anticipation of what I will discover in the architectural masterpiece by Renzo Piano. 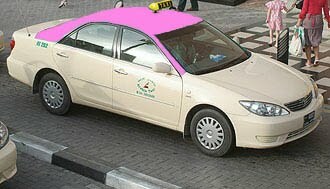 The granite structure awaits me, floating on the little pond of lilies. I enter the garden and run to its collections, both temporary and permanent. Who doesn't want to see 9 Rothkos in a single room, the Man Walking by Giacometti or the very large triptych by Monet of a pond of lilies, reflecting the real locality of the Basel institution. I point to the Calders and the Mondrians and my youngest wonders at Wassily Kandinski because he had been introduced to him in first grade. 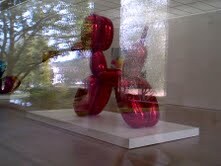 Then we discover the curated show of Jeff Koons. We enter a room full of old model vacuum cleaners. Then follow rooms full of porcelain. These extra-large porcelain pieces represent simplified figures of animals and friendly cherubs. We are in the realm of fantasy. Jeff Koons celebrates children's birthdays with large canvases of pink cakes, balloons, and party hats with confetti everywhere. My son recognises the large puppy shaped balloon because it featured in the movie "Night at the Museum". I carefully and very furtively touched it to confirm it was solid and permanent, not helium and temporarily air filled. I recognised that I was traversing an atmosphere based on illusions. What with the very large twisted blue balloon floating on the pond, as if deposited by a gust of wind, instead of a crane? 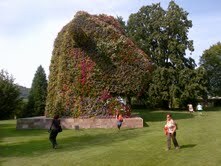 I sat in the gardens, in the shade of a huge shrub designed by Koons, that looked like a dog/a cow an amalgamated animal of flowers. My son and I ate the last bunch of cherries on the last day of August and I told him how happy I was that "he" brought his mother to one of her favourite places on earth, Fondation Beyeler, where illusions are in fact reality.